The Weslo Cadence C44 Treadmill Slides Under the Bed! The Weslo Cadence C44 treadmill is an absolute joy to review! It’s so bad, we hardly know where to start. There are very few Weslo treadmill reviews on this model -- is the reason because consumers don’t want to admit to owning one? UPDATE: The Weslo Cadence C44 is no longer available. Check out the full lineup of Weslo treadmills at reduced prices here. Experts will warn you about the Weslo Cadence C44’s treadmill motor. Any motor rated “THP” isn’t as strong as a more legitimate “CHP”or Continuous Horsepower motor rating. 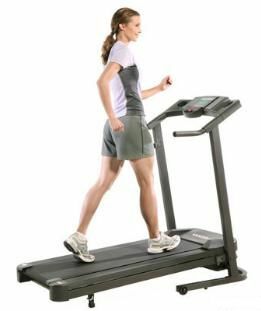 Treadmills must have strong motors or they’ll burn out fairly quickly. The THP term only indicates Peak horsepower and not what it can sustain continuously. Generally, a 2.25 THP motor is thought to perform at roughly half the output of what a 2.25 CHP motor can do. In plain English, this is a weak motor (which then explains the weak motor warranty). Small women walkers will likely do fine on this 90-pound, mini-me Weslo Cadence C44 treadmill. Here is one good point: it folds up and slides nicely under the bed. It’s an unbelievably small unit! Some owners report no problems in the first six months, but many report that the console display, for information such as the calorie count and timer, is inaccurate. And the HR monitor is actually a thumb sensor on the console so it’s quite likely that it can’t be very accurate either. Weslo is trying to sell us on the idea that a 250-lb adult can run on this thing, at the max speed of 10mph, on a tiny tread belt of 16" x 47", without slipping and being injured? Can that THP motor even run the treadmill belt at that speed? We aren’t buying any of this, and you shouldn’t either. We recommend you’d better not consider the Weslo Cadence C44 treadmill and look at a different starter machine instead, such as the HealthRider H150i, or perhaps something in the expanded line of budget Proform treadmills.